Size of Male: 13-15.5 lbs., 10-11 in. Size of Female: 11.5-14 lbs., 10-11 in. More sociable than most terriers, the Border Terrier is one cute pooch with incredible guts and stamina. The breed sports at least two trademark physical features apart from its pint size: a dark muzzle and an otter-like head. As their name hints, this Terrier breed sprang from the border (Cheviot Hills) which divided Scotland and England. The breed is nevertheless known to be one of the oldest in Great Britain, dating back to the 18th century. Many records closely associate the breed with the Fox Terriers. The dogs you see today have not evolved so much from the breed of long ago. The dogs have always fared well in the realm of hunting. They can chase foxes and run alongside horses tirelessly! The American Kennel Club officially recognized this dog breed in 1930. At present, the pooch is slowly making a phenomenal climb in the dog show business. Chasing instincts are strong in the breed, and for this reason, expecting the breed to get along well with your pet cats and hamsters is futile. These dogs are at ease with similarly tempered and similarly sized canines. Caveat: The puny-sized bag of energy will get territorial around larger dogs. This behavior can be tempered through familiarity building. Living Environment – Access to a fenced yard is strongly advised for these cunning escape artists. Also, if there’s such a thing as terrier-proofing your home, do it, as they are notorious for destroying chewable toys in seconds! Provide only sturdy toys and minimize clutter in your space. A home with rowdy kids doesn’t create the best living environment for the breed. Grooming – Coat care is average and they don’t need daily bathing. Their double coat does require weekly brushing and quarterly stripping. For shaping purposes and unless you want them permanently curly, leave the scraggly facial hairs and back fur unclipped. Diet & Exercise – Eating shouldn’t be a problem and they eat with gusto practically any meal you serve them. They are working dogs by heart and aren’t picky eaters. A high-protein diet, especially horse meat, is optimal. Daily physical exertion is a must. Be warned that your pet may get unwieldy during leashed walks. A good alternative would be to let your dog play or roam freely in a fenced area. Health – This is one of the few dog breeds not linked to any major dog health problems. The dogs can mask pain so well that they project a hardy, healthy image. As a precaution, have your pet undergo the usual cardiac and hip exams. Respect training is essential for this dog breed. It is also expected that you will behave dominantly in order to temper stubborn behavior. 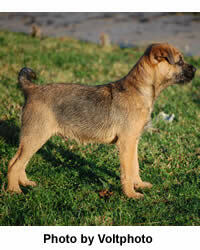 Though willful at times and hyperactive, the well trained Border Terrier excels in agility and obedience tracks.